Born at Kerwood, Ontario on 17 January 1879, son of Lewis Arnett and Angelina Hughes, the family moved to Winnipeg later that year. He was educated at Carlton School and, when the family moved to Brandon in 1886, he attended public school and the Brandon Collegiate. He taught at Chater School and, for two winters, assisted Dr. McKee at Brandon College. He later served as Principal of the Headingley School (1899-1900) and Minnedosa School (1901-1902). In 1903 he moved to Souris and went into the lumber business in partnership with his brother Thomas Lewis Arnett. He became a director and shareholder in the Arnett Manufacturing Company, and also dabbled in Souris real estate. In 1925 he left the company and returned to teaching, working at Wawanesa School, West Treherne School, Hilton School, and Fort Whyte School. He was Principal of Westbourne School (1926-1927), Brickburn School (1928-1937), Kemnay School (1937-1939), and Justice School (1943-1945). On 5 October 1904 he married Laura Vivian Belvadere Todd. 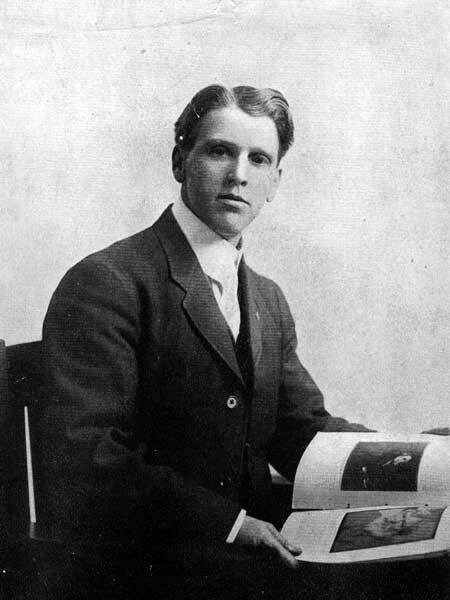 They had five children: Jonathan Hughes Arnett (b 1907), Vivian Belvedere Arnett (b 1909), Emerson Lloyd Arnett, Evelyn Mary Arnett, and Laurel Angelina Arnett. He was a member of the Masons (Seven Oaks Lodge and Bobby Burns Lodge) and the COF. He was also a poet and songwriter. His poems and songs are stored in the National Library of Canada. In 1925 he won a contest to compose the official song for the City of Winnipeg with “All Trails Lead to Winnipeg”, which remains the city’s official song. For many years from the early 1930s to the late 1940s he was retained by Riding Mountain National Park during the summer to run their “Jamborees” consisting of nightly singsongs and Friday night musical amateur nights at Clear Lake which became a staple of summer activities there. He was a correspondent for the Winnipeg Free Press for many years. He died at Brandon on 25 August 1953 and was buried in Brandon Cemetery. Birth and marriage registrations, Manitoba Vital Statistics. “Veteran teacher, J. H. Arnett dies,” Winnipeg Free Press, 27 August 1953, page 10. We thank E. James Arnett for providing information used here.